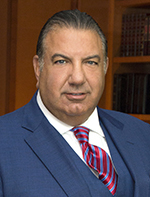 John Koudounis joined Calamos Investments as Chief Executive Officer in 2016. His principal duties include overseeing the firm's day-to-day operations, fiscal function and overall performance. His responsibilities include managing operations, leading business and corporate development, and directing strategic growth initiatives. Mr. Koudounis has 28 years of financial services experience including executive leadership in the global securities business and a deep background in global capital markets. Most recently, he served as President and Chief Executive Officer of Mizuho Securities USA, Inc. (MSUSA), a subsidiary of Mizuho Financial Group, one of the world's largest full-service financial institutions. During his tenure at Mizuho Securities he built the firm into a full-service investment bank, expanding its debt and equity capital markets teams. Under his leadership, the firm grew in profitability, number of clients, and product diversification, allowing Mizuho to be considered globally as a top tier investment bank. Prior to joining MSUSA in 2008, he was Managing Director and Head of Fixed Income for ABN AMRO North America where he played a critical role in that firm's successful growth. Mr. Koudounis is a public speaker and appears frequently on financial news programs including CNN, Fox Business, CNBC, Bloomberg TV and others. He is a member of the Leadership Council at Concordia and the Bretton Woods Committee. He received his B.A. in International Diplomacy, Foreign Affairs and Economics from Brown University.